Ok.... so when you all go to Target you walk out with around $100 worth of stuff too , right? I know I can't be the only one. Right? And only 1 out of every 10 times did we actually intend on spending that much money. Their store designers/ marketing/ shelf putter-uppers are geniuses. To quote the movie, "Twilight"..."Everything about us invites you in...our look, our smell, the way we stock our shelves". Ok, well maybe that last part wasn't from the movie but that's how it feels to me. I'm powerless to stop it. If we do walk out of there under $100, my husband and I almost give each other a high five. I know I'm all kinds of giddy on the inside. I started thinking the other day... what I can do to stop the madness? Only get what we NEED, then get out and....wait for it.....only go once a month!!! What??!!! That's crazy talk. We are in Target every week. I'm not kidding. We are always forgetting that we are out of something and then going back which means there goes another hundred dollars. Bye bye. All I can think is spreadsheet here we come. 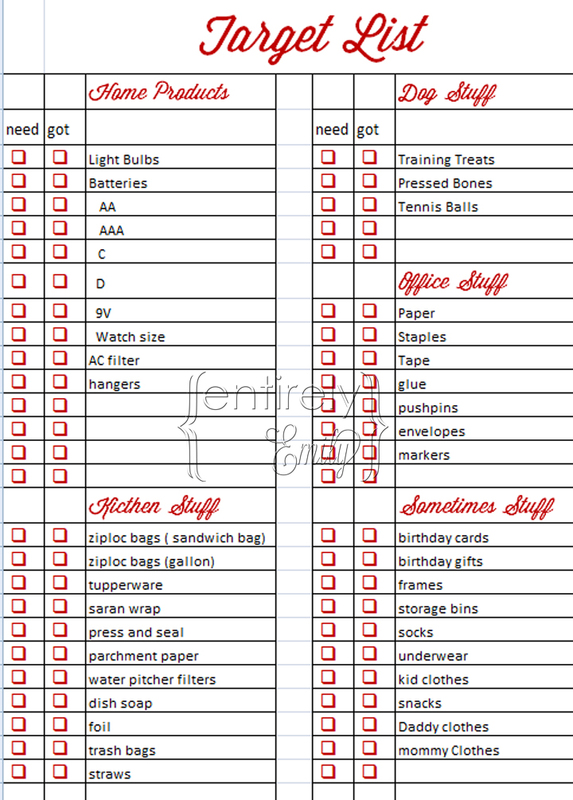 I know I'm not the first blogger to make a spreadsheet to go shopping but I haven't seen one about Target yet. I'm going to make a list of things we regularly buy at Target and then we have to stick to the list. We will be able to put some specialty items on the list when before we go that are regular items but again. I know this isn't rocket science but it actually took some thought to come up with this list and I want to share it with you. If it ain't on the list, me no buy. ( I love to let go of the English language every once and a while) I'll give you an update soon and let you know how it's going. Here is the list. 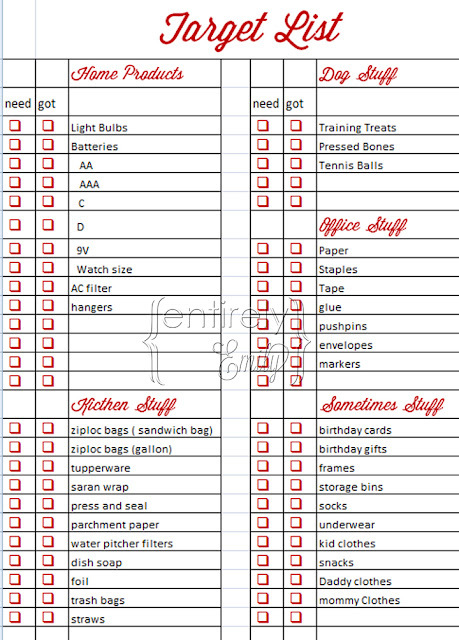 I did one in Excel and a blank one as a PDF that way you can change all of the items in the list to what you and your family need if you would like. If you want to make your own and like the font, I used a free font called Wisdom Script. To download the font, you have to type in 0 for the cost and just hit download. And the tiny red boxes are the font Wingdings, the upper case letter Q.
Hahaha, I love this! I am such a Target addict! I have put myself on "Target Ban" for the months of January and February and I am totally going through withdrawal. I am REALLY going to try and not overspend there when I go back in March, but it will be so hard! your title amused me, b/c we fall into this problem, too. I still think even with a list, I'd hit up all the clearance and the end caps. I love your checklist! So comprehensive. My trouble starts when I find myself saying, "Let me just see if they have this..." Then the wandering/purchasing unnecessary items begins leading to a +$100 bill. My strategy is to always make a list ahead of time and stick to it. Usually it's not that tough because my 21 month old is a handful. The faster we get through the list, the faster we're out of there! love this! I have the same problem at target. going to steal your spreadsheet, and I'm already thinking of stuff I would add...unless I missed them on your list: dryer sheets, laundry detergent, Clorox wipes, toilet paper, jet dry, and dog food. those are the ones we always go out to get and then forget. lol.